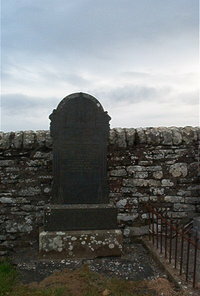 Erected in memory of our father and mother. George Gunn died 6th March 1907 aged 80. Wife Isabella Graham died 24th November 1904 aged 74. Daughter Isabella Gunn or Swanson died 20th February 1903 aged 44 interred Lair No 772. Son John Gunn died 3rd October 1884 aged 15. Son James P Gunn died 17th November 1884 aged 12.